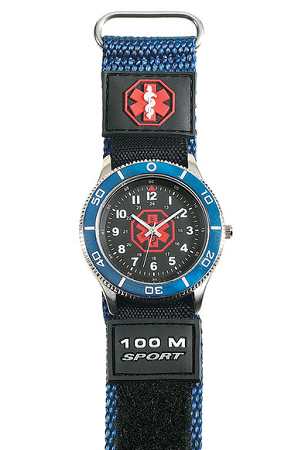 Men's medical ID sport watch with blue fast wrap strap. 38mm case. Easy to read dial. 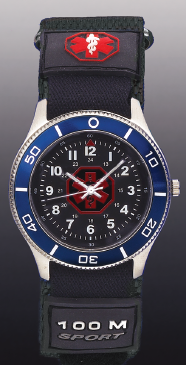 Both the face and strap prominently display the medical alert symbol. Glow in the dark hour and minute hands. Stainless steel case approximately 1 1/8 inch diameter. 100 meters water resistant. Fast wrap sport strap adjusts to fit approximately 6 to 9 inch wrists. I purchased this item for my son who would never wear any of the other ID products. He is wearing the watch so I am very happy. Thank you so much for rushing my order... you called and emailed me well after hours. I really appreciate the wonderful customer service. I had this watch processed, engraved, set for accurate time (that was a nice touch) and rush shipped for me to have just a couple of days later. THANK YOU to all! Like the watch, nice way to wear medical alert, but the watch Band leather peeled after use in short time. 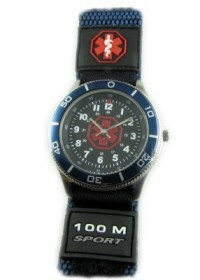 The sport watch medical alert was an excellent choice for my 12 yr old son. He doesn't like bracelets but he'll wear a 'cool' watch. Thanks for the option. I showed his surgeon who was equally impressed and says he will recommend this alternative. **I would like to see easier access to the important engraving on the back. It is a little difficult to manipulate past the elastic -- I'm thinking in terms of a crisis situation that would warrant quick information. I still give it an A!!!!! 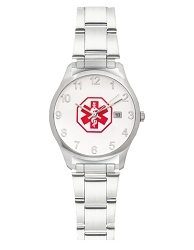 I searched high and low for a medical alert watch that my son could wear in sports, and would survive a shower or two. I'm so glad we found this watch. My son won't wear a necklace or bracelet because they irritate him, the watch is a great alternative. Highly recommend it for other teens. The watch is fine. The only problem is that in order to see the information on the back of the watch you have to take the band off. Outside of that it works okay and is a nice looking watch. They should make more models with a soft band, so that people would have a selection, not just one style. Our son's medical watch has been received and we really appreciate your help in getting it to us so promptly. I purchased the watch for my diabetic son. From the beginning to end of my dealings with this company I found them to be extremely efficient, courteous and their customer relations was nothing but excellent. I would highly recommend this company to anyone who is looking for a medical alert item. My son is very happy with his watch and loves wearing it. It is also waterproof which means he never has to take it off. Well done elegant medical! Thank you. This was a great alternative for my husband since he hates wearing any jewelry. It's also great for him since he works outside. The only thing I didn't like is the engraving is hid behind the watches' band. My husband loves his watch! My husband loves his watch! 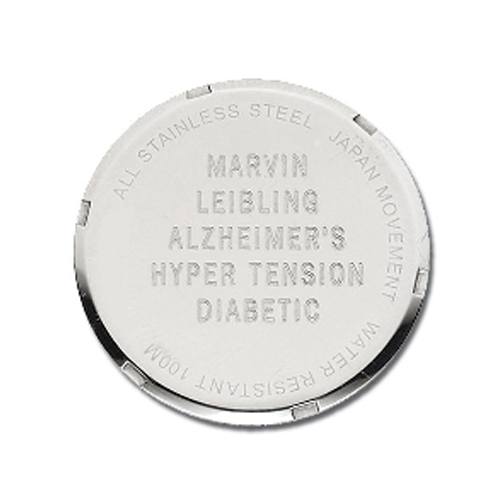 Great quality and I have peace of mind knowing that his medical information is engraved on the back.